Much like the oft-maligned Canadian department store, content strategy has a stodgy reputation. Rooms full of nerds wearing outlandish glasses obsessing over spreadsheets. Okay, that happens. But! That’s not all that happens, okay? Because content strategy, at its core, is about people. Their hopes, their dreams. Their frustrations, their fears. To be a content strategist is to be an organizational therapist. You don’t have to be a card-carrying “content strategist” to make your organization’s content better. You can start the change right now, even with your limited time, budget, and resources. You just need a sharp eye and a good ear. Preferably two of each. So come, fellow content warriors. Lay down on this couch right here. Take off your shoes. Tell me about your problems. Shh, it’s going to be okay. Data is created by computers. Computers are machines — they do what they’re told, they don’t talk back. Content is created by humans. Humans obsess over every word. They sit in meeting after meeting, arguing about page titles and navigation structure. They don’t make the “best” decisions. They make the best decisions they can. Don’t make plans for machines. Plan for humans — the squishy, imperfect, illogical beings that we are. 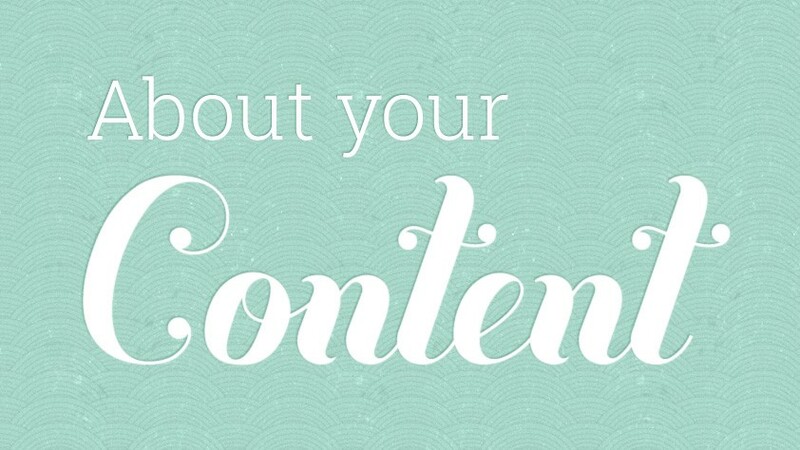 Too often we think of content as a product — a self-contained object that exists on its own. But content can never exist in a vacuum. There’s always a story behind the story. Why is that product description a mind-numbing tangle of terribad? Maybe the web editor that was supposed to approve it had 70 other pages to edit by the end of the day, and her co-worker is on vacation so she has to manage the company social media accounts too, and OH WHO CARES WHO READS THIS STUFF ANYWAY. Maybe the content author that wrote it just started on Monday, and has no idea what’s going on, and hasn’t written a damn thing since high school, and nobody told him he’d have to do this, and what’s a CMS again? Is that their fault? Of course not. If you want great content, you need to hear those stories. You need to sit down with everyone that touches, looks at, writes, or cries over your web content, and find meaningful ways to make their lives better. So if you have that one crusty stakeholder that just won’t listen when you tell him that no one cares about his ten page company history section, find out why. Take him out for a coffee, ask him out for lunch. Maybe you’ll find out that his great-great-grandfather started the company in 1901, and his family will disown him if he dishonours their history. He’s not tied to the words on the page. He cares about the why behind the words. That means that you, the kind, thoughtful content expert with great listening skills and a winning smile, can find a solution that meets his (real) needs, and yours. Remind your stakeholders that they’re writing for real people, just like them. It can be hard to remember when you spend your days staring at a screen. Where’s the humanity in that? Don’t be abstract. Instead of talking about “users” or “visitors”, tell real stories. Talk about the lady named Nancy you met in user testing that spent five minutes trying to find emergency contact information. Nancy is much harder to ignore than a generic “Visitor A”. My favourite french disco robots, Daft Punk, have been asking us what it is to be human since the mid 1990s. Seems like the content strategy community feels like they have to choose — human or robot? Feelings or facts? Truth is, content needs both. You need to understand every angle — manual and mechanical — to create a process that really works. Don’t get me wrong, I love robots. Especially when they’re French and play guitar. But ultimately, content is a flawed, messy, human process. Learn to accept it. Embrace it, even. Love it for all its quirks, and it’ll love you right back. Senior UX lead at @Shopify. Undercover ninja. Lover of hyperbole.